How to maintain the salt lamp? ALL NATURAL LIGHTING AND AIR PURIFIER: Himalayan salt lamps provide a pure and natural source of light. Great as a night light, bed light, meditation light, or prayer light. Each and every lamp is unique, as our Himalayan salt is hand-mined.the salt crystal lamp heat up and emits negative ions that fight against electromagnetic radiation， purify the air, helps you sleep better at night, and allowing you to wake refreshed. SAFER PATENT DESIGN TOUCH DIMMER SWITCH (UK 220-240v only): It comes with patented UL-listed, FCC & ROHS approved touch dimmer switch to adjust brightness and match the ambiance.Definitely safer than other brands that has potential fire hazard. 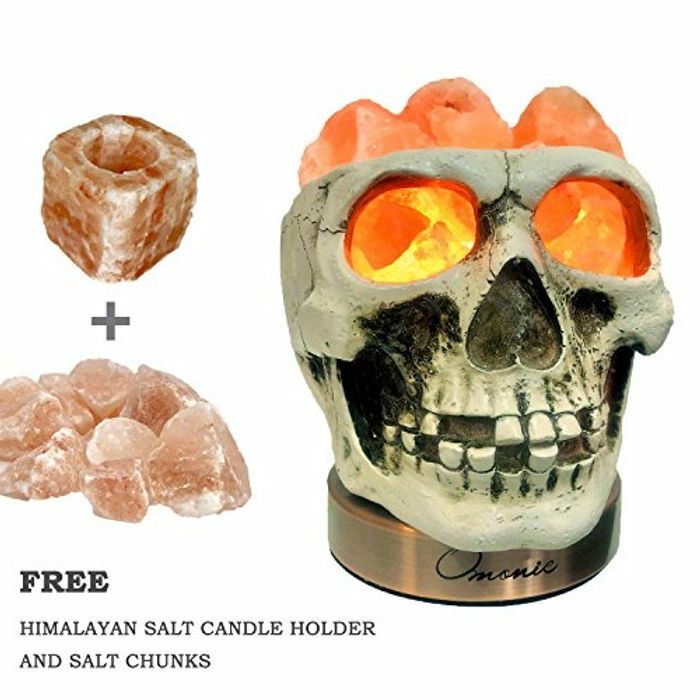 VERY RARE SKULL DESIGN HIMALAYAN SALT LAMP SET GIFT PACKAGE YOU CAN'T FIND SECOND ONE ON THE MARKET:Birthday gift, Valentine's Day gift, Mother's day gift, Father's gift, Romance & Love, Shock and vibration resistant, Include salt lamp,nightlight,candle holders,bath salt,all of these made by 100% Pakistan Himalayan crystal salt. This would give me night mares. Thank you for sharing this good deal. my other half would love this, thanks for sharing this offer!